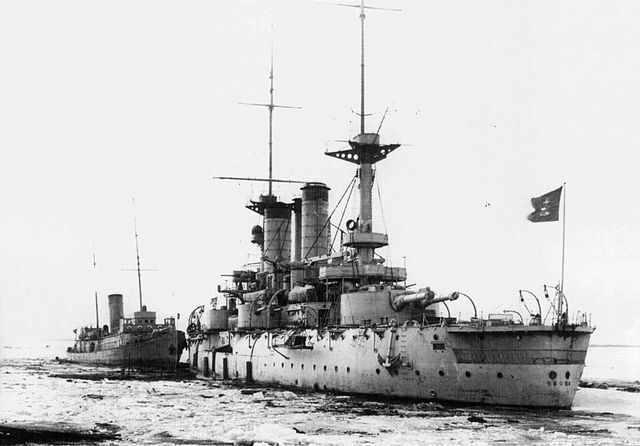 Before the Petropavlovsk class dreadnoughts, Russia built locally a class of pre-dreadnought battleships already called by that name, but which did not existed anymore after 1905. Only Tchesma (ex-Poltava, ex-Tango) was in service in WW1, after being recovered. In fact all three were victims of the double maritime disaster that was the Russo-Japanese war.. In 1882, the Tsar Alexander III patronized its most ambitious naval plan in the History of the country (-save from Peter the Great’s reforms), that would have raised it on par with the largest navy at that time, the Royal Navy, and the French Marine Nationale. This plan asked for no less than 16 battleships for the Baltic Fleet alone, but to be delivered on 20 years. Naval Ministry, Vice Admiral N. M. Chikhachev ten years later, proposed a combination of six 1st class and four 2nd class battleships complemented by armoured coastal battleships to made for the numbers. The Petropavlovsk-class was required to fill this first-class battleship tranche, meeting requirements for a well armoured ship, 10,500 long tons in tonnage and capable of 17 knots for a 3,750 nautical miles range and excellent seagoing capabilities. Designers started working on larger Imperator Nikolai I class, but improved, with four 12-inch (305 mm) guns in barbettes as main armament. Another design that was studied was the Imperator Aleksandr II class for its bad casemate-mounted secondary cannons unusable in rough weather. 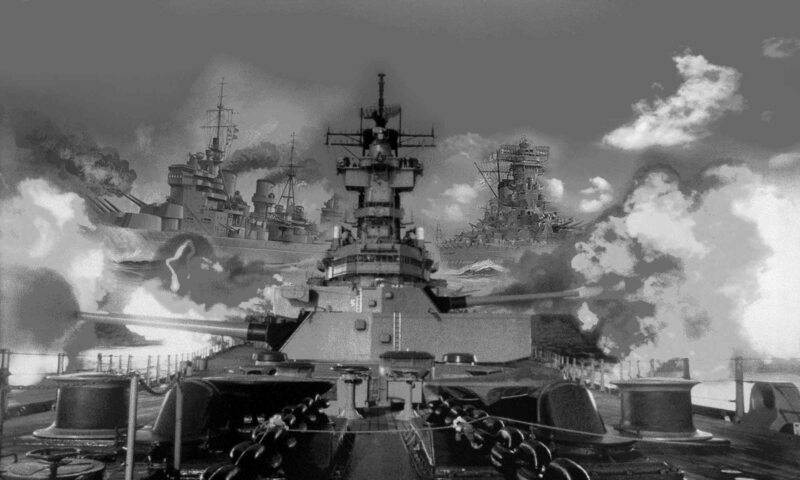 The Naval Technical Committee also studied the American Indiana-class battleships praised for its massive secondary armament of 8-inch (203 mm) guns all in turrets on the upper deck. This system allowed to only mount lighter barbette armament in the hull, helping design a flush-deck hull that would save weight and gave high freeboard. Comprised in the 10,000 tons tonnage, the armour included a full-length waterline armor belt compounted with the slope gained by making a slight tumblehome in the cenral section. The final blueprints were reviewed in comission and approved in January 1891. The designed speed of 17 knots could only be reached by forced heating, therefore rather than to redesign the ship, the Navy was content with 16 knots. Compromised in the belt had to ebe taken. To accomodate the upper belt, the waterline belt was shortened so both ends were protected only by sloping armor deck. The final blueprints also included the change from the planned 8-in guns to more reasonable 6-in, allowing to cram four more, protected by Sissoi Veliky’s turrets instead of barbettes. 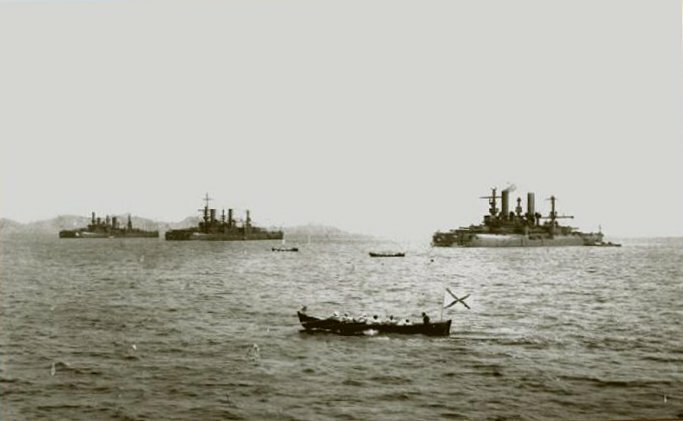 In the end, with a metacentric height of 5.43 feet (1.7 m) all three were good seagoing battleships, and stable firing platforms. The main armament comprised two pairs of 12 in/40 cal. guns and turrets fore and aft propelled by hydraulic power, both for loading and traverse, while ammunitions were electrically lifted from deep storage (58 rounds per cannon). The rate of fire was 90 seconds, but in service if fell to just one by three minutes instead. The turrets had to be reinforced later to withstand the stresses. Maximum elevation was 15° and each shell weighted 331.7 kg (731-pound), fired at 792 m/s (2,600 ft/s) to about 10,980 m (12,010 yards) at 10°, the maximal ballistic trajectory. The Liuzhol stadiametric rangefinders were relatively innovative for the time. They used the angle between two vertical points, generally the visible ship’s waterline and crow’s nest, to estimate the range. This data was transmitted to the gunnery officer to calculate the right elevation and deflection, his commands were then transmitted via a Geisler electro-mechanical fire-control system to each gunnery station onboard. The secondary armament comprized twelve quick-firing French Canet Model 1892 six-inch guns of 45 caliber. Eight were paired in four turrets on the upper deck, the remainder four were mounted in embrasures in the sides of the hull a deck below the turrets, and alternating for weight distribution and stresses. Loading, and traverse were electrically-powered but traverse was manual. The latter was 135° for the turrets at +15° elevation, or down to −5°. The rate of fire 2–3 rounds per minute or more. However the ammunition hoists seemed troublesome and reduced the rate of fire. The hull embrasure guns had a 100° traverse. 200 rounds, each weighing 91.4-pound (41.46 kg) were stockpiled for each gun. They fired at a muzzle velocity of 792.5 m/s (2,600 ft/s) at a max range of 11,523 m (12,602 yards) wat +20° optimal incidence. Tertiary armament destined to fight torpedo boats included twelve QF 47mm (1.9 in) Hotchkiss guns, also in hull embrasures, the remainder were located high up in the superstructure. Each shell was 3-pound (1.4 kg) ans was fired at a muzzle velocity of 569 m/s (1,867 ft/s). In addition, Twenty-eight smaller Maxim QF 37-millimetre (1.5 in) guns were located also in hull embrasures, superstructure and higher up in the armoured fighting tops, each 1-pound (0.45 kg) and fired at 402 m/s (1,319 ft/s). For close-quarter combat, both battleships had four 15-inch (381 mm) torpedo tubes above water on the broadside, and two smaller broadside underwater 18-inch (457 mm) tubes. Only the aft 15 in torpedo tubes were protected, by the upper armor belt. Both ships were also designedto carry rails able to support 50 mines. As customary for Russian practice, they replaced the anchoring ASW net, making a wide protective bubble around the ships in any area. First of its three ships class in service, she departed Kronstadt in October 1899, reaching Port Arthur on 10 May 1900 as flagship of the Pacific Squadron. Commander Vice Admiral Nikolai I. Skrydlov first assignation was to suppress the Boxer Rebellion. Petropavlovsk became in February 1904, at the eve of the Russo-Japanese war, the flagship of Vice Admiral Oskar Victorovich Stark. The second day, Petropavlovsk was engaged and took three hits in the bow but no significant damage, without however scoring back any hit. Stark was relieved of his command and replaced by Vice Admiral Stepan Makarov in March. 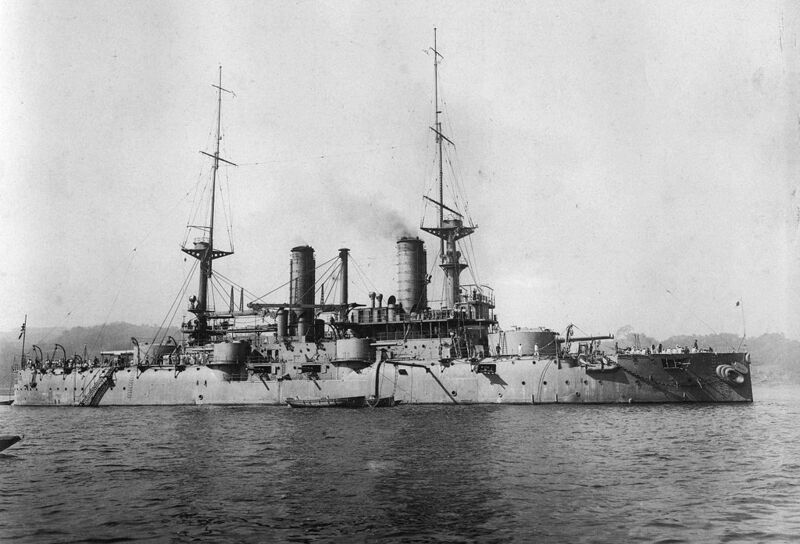 Petropavlovsk sortied but headed back to Port Arthur, joining the rest of the Pacific Squadron under the protection of coastal fortifications when discovering the main Japanese battlefleet. Unfortunately Petropavlovsk struck one mine and sank in less than two minutes with massive casualties, including Admiral Makarov. Only 7 officers and 73 crewmen were rescued. 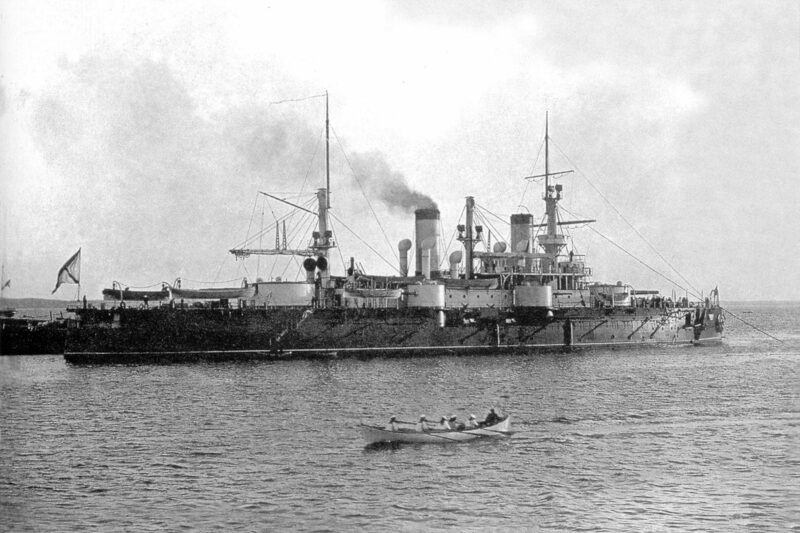 Third ship of the class to enter service on 1 June 1895 (in service by 1900), the Sevastopol went to Port Arthur in 1904 and also fought two days after her arrival, being hit without casualties. She sortied in March to support cruisers and destroyers, but after discovering the main Japanese fleet, went back to the harbour, but passed through the minefield without hitting any mine. The new commander, Vice Admiral Wilgelm Vitgeft, tried to conduct the fleet to Vladivostok on 23 June, but abandoned after encountering the Japanese. 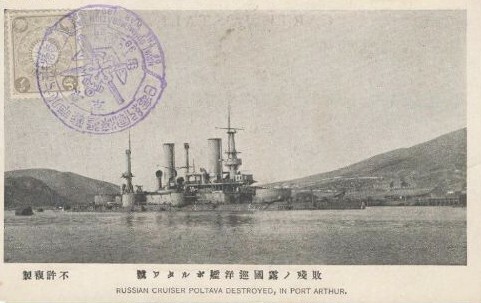 Back to Port Arthur, Sevastopol struck a mine and was heavily flooded, with about 1,000 t of saltwater, but survived (with the crew prompt reaction) and reached back the port, being under repair until 9 July. She suffered an accident, making some casualties. All of light guns in the embrasures were removed and partly remounted on the superstructure or use to bolster the land defenses of Port Arthur, facing a Japanese landing. Vitgeft tried to break out again the Japanese blockade on 10 August, pressed by Tsar Nicholas II, but was spotted and had to face the Japanese might in the early afternoon, at the Battle of the Yellow Sea. Sevastopol was the last battleships in the Russian column but Vitgeft masterfully maneuvered, and convert the sortie into a stern chase. Before sunset Vitgeft was killed by a lucky hit and Rear Admiral Prince Pavel Ukhtomsky tried to regain control of the squadron, leading the ship in the night back to Port Arthur. Sevastopol had been hit several times and deplored 62 wounded and one KiA. On 23 August, Sevastopol sortied again to shell Japanese troops besieging the port, but struck a mine when turning back home. It blew up the hull near her forward magazines, and was completely flooded, but she was towed back into port. Repairs lasted until 6 November and Rear Admiral Robert N. Viren, the new fleet commander, preferred to dispatch men and guns in the defenses of Port Arthur. Sevastopol lost all of its remaining 37mm guns guns, and she was damaged by a land bombardment, being hit by 280mm Japanese batteries. Unfortunately for the Russians, the Japanese took Hill 203, allowing to see the harbour and direct the fire with precision in December. 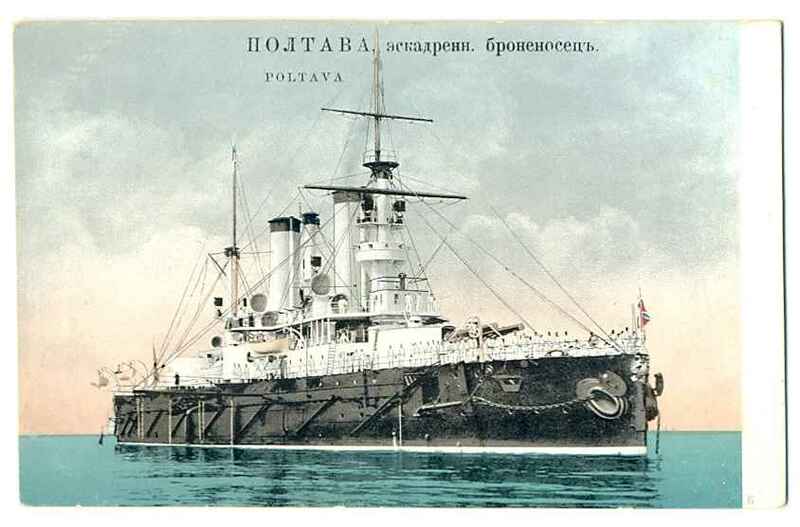 While Poltava was sunk Sevastopol (Capt. Nikolai Essen) took refuged under the only surviving coast defense guns outside the harbor, rigging torpedo nets and laying a protective minefield. Repeated attacks failed, but on 16 December a torpedo hit the ship in the stern, a lucky hit in a snowstorm. 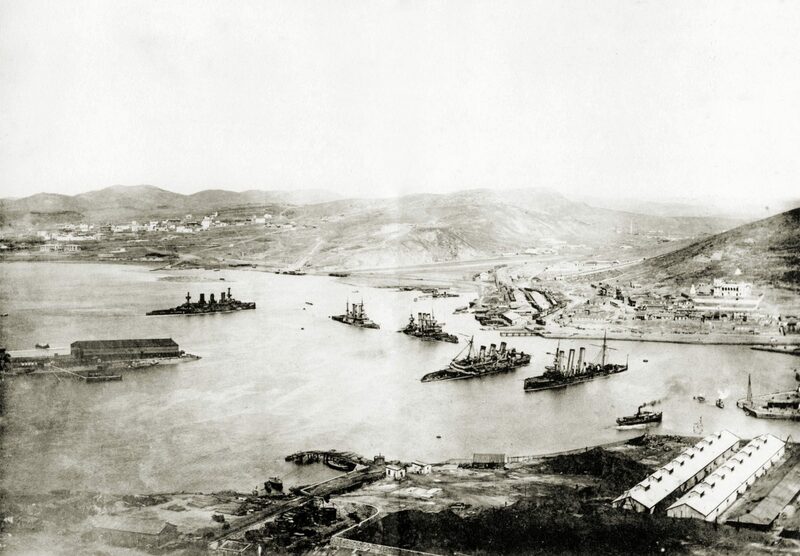 Sevastopol was towed to deep water only to be scuttled when Port Arthur surendered in January 1905. 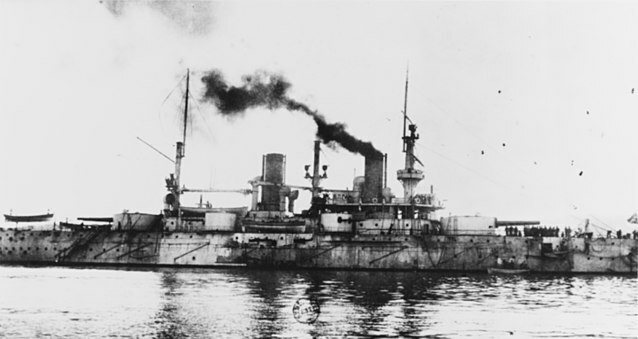 The only survivor of a class of three ships of the Petropavlovsk class, the Tchesma, was formerly the Tango, within the Japanese imperial navy, and before the Russo-Japanese war, the Poltava. Second ship of the class, she was launched in Saint Petersburg in 1894 and completed in 1899. She was therefore recent in 1904. 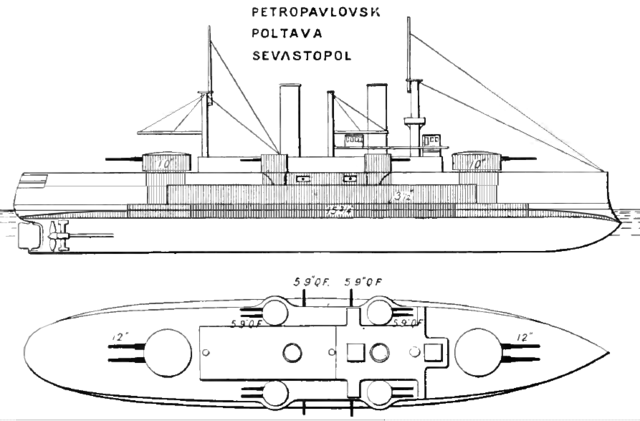 The Petropavlovsk design was inspired by the English Royal Sovereign class, while using French model turrets and French guns for the secondary and tertiary artillery. Her vertical protection extended over 66% of her length of the ship and the horizontal protection was guaranteed by a “turtle back” ranging from 50 to 76 mm. The belt maximal thickness was 370 mm likely to minimize the impact of a torpedo, and all steel-nickel Harvey compound. “Tchesma” was not the same of the first Russian battleship, the previous one, stricken in 1907, was a 1886 Ekaterina II class battleship. At Port Arthur, all three battleships were the spearhead of the fleet, bearing the mark of Admiral Makarov. 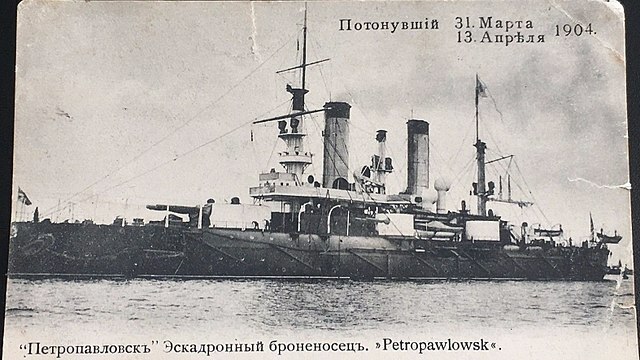 The Poltava sank alongside Sevastaopol in the harbour after a deluge of accurate land firing and was later refloated and repaired to serve as the Tango from 1908. 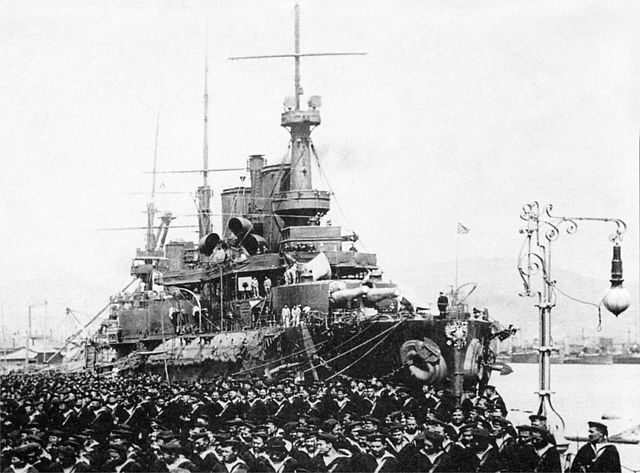 However during WW1, because of the alliance of Japan with the triple entente, Tango was delivered back to Russia, renamed Tchesma on April 5, 1916. She made a journey from Vladivostock, her first assignment, to the White Sea (Arctic) passing through the Indian Ocean, Suez Canal, Mediterranean, Atlantic and the North Sea. She was not assigned there until February 3rd, 1917, and rearmed (see specs). She was seized by the allies in 1918, and broken up by the soviets in 1923. Armament: 4x 305 mm (12 in), 8× 152 mm (6 in), 2x 76 mm AA (1917), no TTs, no mines. 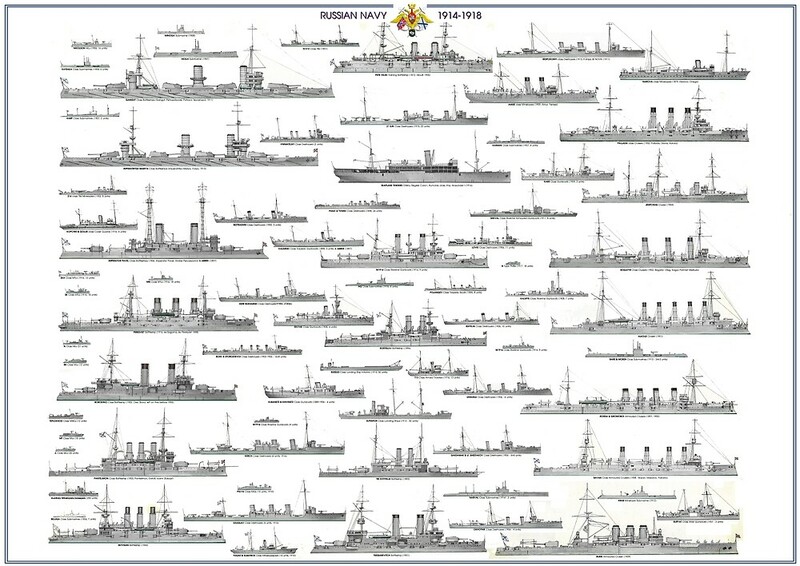 Help Naval Encyclopedia to grow and get the Russian Navy WW1 poster !